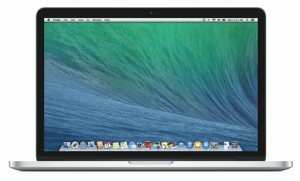 This version of the 13.3-inch MacBook Pro with Retina display (model ME866LL/A) features a 2.6 GHz Core i5 dual-core processor, 512 GB of flash storage, and 8 GB of onboard RAM. 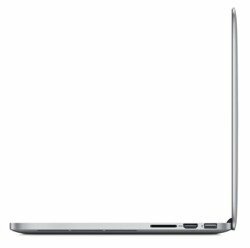 The MacBook Pro also includes both a high-speed Thunderbolt port and two USB 3 ports, enabling you to easily connect to external displays and a wide variety of high performance peripherals. With up to 60 percent faster PCIe-based flash storage compared to the previous generation and new 802.11ac Wi-Fi for up to 3x faster wireless, the new MacBook Pro is quicker and more responsive than ever. You'll also get up to 9 hours of battery life while on the go. This model features a 2.6 GHz dual-core Intel Core i5 processor with Turbo Boost speeds up to 3.1 GHz. 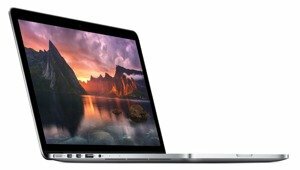 It's complemented by Intel Iris integrated graphics, which can boost performance by up to 90 percent (over the previous generation MacBook Pro with Retina display) — so it can handle both everyday tasks and graphics-intensive creative apps.